Kit Rae Mithrodin Swords for sale are 42 ¾ inches in all. 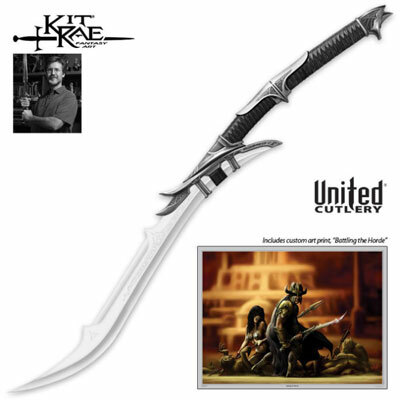 These official Kit Rae swords feature a 23 ¾ inch mirror polished 420 stainless steel blade. The solid metal handle has an antique finish and features a real leather wrap. They include a certificate of authenticity and a free fantasy art print entitled Battling the Horde. Buy the official Kit Rae Mithrodin Swords for $129.99.